Scientists in Ecuador have discovered a frog with shape-shifting abilities. Researchers Katherine and Tim Krynak weren’t looking for shape-shifters. In fact, their discovery was a complete accident. They spotted a tiny, spike-covered frog they hadn’t seen before and took it to the lab to photograph. But when they placed the critter on a smooth surface, the spikes disappeared. When they returned it to a mossy enclosure (thinking they had picked up the wrong frog), the spikes came back. “We simply couldn’t believe our eyes, our frog changed skin texture!” says Katherine Krynak. The change in skin texture allows the frog to blend in better with its environment. Many animals use some form of camouflage to hide from predators, and some, such as squid and chameleons, even change colors. But this is the first time scientists have found a frog that could change its skin texture to enhance that camouflage. The species is new to science, but the scientists say it has a close relative that shares the shape-shifting ability. However, no one had noticed the changes in skin texture before the discovery of the new frog. Want to know more? 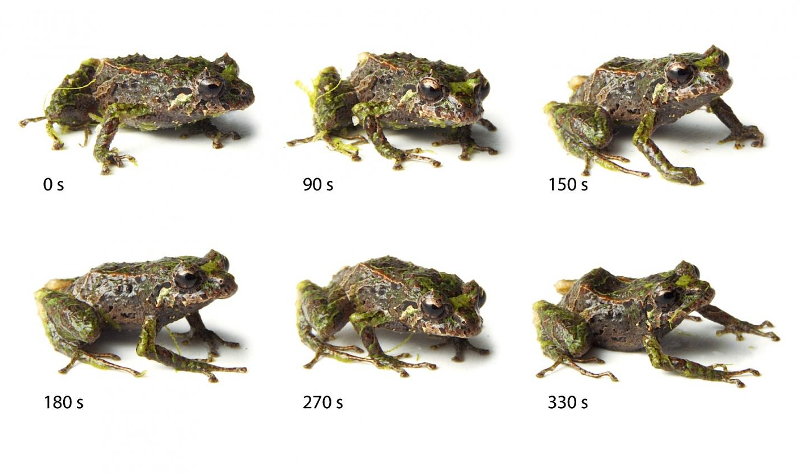 Check out the Exploratorium’s page on camouflage in frogs.